Prince George's County Fire/EMS Department: Bladensburg Volunteers Awarded for 'Bestowing benevolence on one in an unfortunate circumstance"
Bladensburg Volunteers Awarded for 'Bestowing benevolence on one in an unfortunate circumstance"
Bladensburg Volunteers Badon, Jasiecki, Pruiksma with Association President (red shirt) Charles Walker and Fire Chief Bashoor. Prince George's County Fire Chief Marc S. Bashoor presented Emergency Services Awards to three Bladensburg Firefighters for their benevolence and humanity. The awards were presented during the monthly meeting of the Prince George's County Volunteer Fire and Rescue Association held at the Bunker Hill Fire/EMS Station in Mount Rainier. 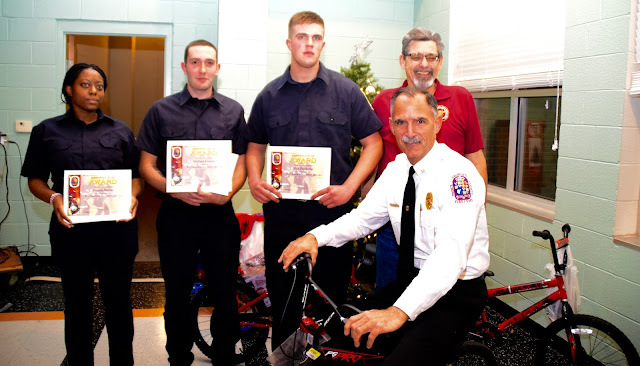 Bladensburg Volunteer Fire Fighters Nick Pruiksma, Matthew Jasiecki and Yvonna Badon were presented the awards after Chief Bashoor spoke of their efforts. Bashoor stated; On Saturday, October 31, 2015, you and fellow crew members responded to the 5500 block of Landover Road for a 62-year-old male complaining of chest pain. You arrived to find a homeless man who reportedly had been transported several times to different area hospitals over a few days prior to this incident. The previous emergency room visits concluded with him either being discharged hours later or leaving against medical advice. At the crew’s request to take the man to the hospital for further evaluation, he became belligerent and demanded someone call the police. The Northern EMS Duty Officer was notified of the situation and responded to the scene, where he encountered the elderly male attempting to remove his soiled and ripped pants. After speaking with the agitated patient, the Duty Officer persuaded him to let the ambulance crew transport him to the hospital for further evaluation and treatment. Upon reaching the hospital, you and your crew assisted with getting the patient undressed and bagging his soiled clothing and shoes. The poor condition of his belongings moved you to go to a local Salvation Army Thrift Store to purchase him some much needed items. The store’s manager learned of intended kindness and permitted the merchandise to be purchased at 50 percent off the ticketed price. A female customer overheard the story and offered to pay for the entire purchase. You and your crew members returned to the hospital and upon giving the homeless patient a bag filled with clothing and a pair of shoes, he expressed gratitude for the crew’s generous deed. Your willingness to go above and beyond the call of duty by bestowing such benevolence on one in an unfortunate circumstance is commendable and worthy of recognition. The kindness you and your crew displayed stirred the compassion of the store manager and the female customer and demonstrated that there are still some pretty decent people in the world. Therefore, it is my pleasure to present to you a Fire/EMS Department Emergency Services Award. 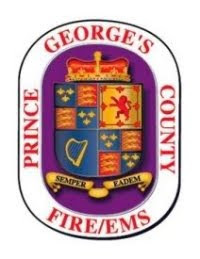 Your actions reflect well on you personally and professionally, the Bladensburg Volunteer Fire Department & Rescue Squad, Inc., and exemplifies the excellent caliber of service we strive to provide to the residents of Prince George’s County.